With far fewer entry barriers than other markets, Middle East has gained a fair amount of attention from FX firms. Finance Magnates spoke with Hussein Sayed, Chief Market Strategist for the Gulf and Middle East region at FXTM, who explained the company’s methodology surrounding operating in the Middle Eastern business environment. 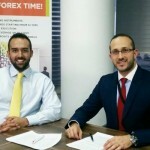 Hussein Al Sayed represents the face and voice of FXTM within the MENA and GCC region. He is best known for his role as an anchor at CNBC Arabia hosting the popular evening show, Bursat Al Alam. Could you please detail your professional background, and what led you to join FXTM? My career in the financial services industry started in 2002 when I was still a university student in my home country of Lebanon. Over the 14-year span of my career, I served as a dealer and trader and led analysis departments covering equities, commodities, and foreign exchange markets for a number of firms. In 2012, CNBC Arabia approached me to join their international markets team, and this is how I started hosting the popular show Bursat Al Alam. Having been a regular guest on Bursat Al Alam since 2008, it was an honour to become its host. Joining FXTM wasn’t a hard decision to make. Although the brand is relatively new, the speed with which it’s evolving is astonishingly high and the company has quickly become recognised as an innovator within the forex industry. I have a strong belief that soon, it will become further established as an industry leader, and I look forward to contributing to the company’s success. I’ve always wanted to support traders in their journey, and particularly here in the Middle East where novice traders need guidance and education. Understanding how macroeconomic events impact the markets is essential, and by sharing my expertise I hope to enable them to make informed decisions on the markets. Raising awareness of the FXTM brand with local traders is another one of my key priorities. FXTM has a strong reputation for offering excellent customer service and trading conditions, as well as a range of cutting-edge products and services, and I feel that the company has a lot to offer Middle East and global traders. While retaining your role as the anchor of the Bursat Al Alam show on CNBC Arabia, what are your day-to-day responsibilities within FXTM? My day-to-day responsibilities within FXTM include providing traders and investors with insights into the latest macroeconomic trends and developing educational materials for seminars and webinars. I also represent FXTM at events and conferences taking place in the Middle East, for example recently I chaired a panel discussion at the 11th Middle East Retail Banking Forum and Expo in Dubai. Investments of FX companies into sports sponsorship is a global trend, and there has been no sign of any let up yet. Do you believe Middle East-focused brokers could embrace this marketing pattern? Additionally, do you think that employing visible figures in the financial media, like you and Joe Hawa, could be an alternative? As you rightly mention, sports sponsorships are a global trend among FX industry companies, and Middle East-focused brokers can certainly benefit from such sponsorships as a way to engage local traders. In fact, FXTM has recently announced its partnership with renowned BASE jumper and Red Bull athlete Valery Rozov. We will be supporting Valery as he performs a series of unique jumps as part of the #FXTMbasejump project. This exciting project is designed to appeal to traders around the world, including those in the Middle East, who will be able to follow Valery’s progress on our website and social media channels. In terms of the use of ‘visible figures’ in the financial media, I wouldn’t say this is an alternative to sponsorship. What are the advantages retail FX firms could attain by operating in the ‎Middle East, namely from a retail ‎client business perspective? And are there any specific needs for this region? From a business growth perspective, we’ve noticed a strong level of demand from retail traders in the Middle East, and there is a clear interest in trading the currency and commodity markets amongst investors in the region. However, the Middle East is a very diverse region and certain markets are more mature and have a higher level of trader knowledge. In terms of how this translates into needs, we provide localised products and services, which can then be tailored to the specific requirements of the individual trader. For example, a trader who is interested in trading CFDs on shares can sign-up for the FXTM Shares Account, which offers trading on over 180 share CFDs whose pricing is directly linked to the NYSE and NASDAQ exchanges. This trader can also choose a swap-free option, which is in line with Islamic finance rules, and receive customer support in Arabic. Another example is for those looking for investment opportunities, FXTM Invest, our in-house investment program, provides a perfect environment for beginners to follow and copy suitable and successful traders with several enhanced risk management options and ability to invest in more than one strategy simultaneously. Although you have a strong focus on Asia and the Middle East, FXTM is regulated by CySEC and registered with the UK FCA, so it is mainly a Western firm. Many questions may arise under this situation. FXTM is an international broker with a global reach and with clients across the world. Since the outset, the company has had a particular focus on Asia and the Middle East, and so in that sense, we would not consider ourselves to be a Western firm. We offer a localised service which we have seen is particularly popular with Asian and Middle East audiences as we cater to their specific needs. Are these licences sufficient for the company to provide and market its full suite to traders in the region? Absolutely, all our clients in the MENA region benefit from our excellent trading conditions, innovative products and services and the highest standards of service. We employ top-tier auditors and advisors with expertise in various compliance matters to affirm that all company operations are in accordance with the regulations. In addition, the company has a strong risk management process in place, to ensure that client funds are protected at all times, even in periods of market volatility. Our commitment to providing a trusted and transparent service was recognised at the 2015 MENA Awards where we were named as ‘Most Trusted Broker’. This is the first part of a special interview with Hussein Sayed, Chief Market Strategist for the MENA region at FXTM. The second part will be published later this week.